The Bangladesh government has in the last few days launched the country's first satellite, named Bangabandhu-1. Back in May 2012, I wrote a series of three articles for the Bangladesh daily newspaper, The New Age about how the whole process started with serious irregularities in the tender process that resulted in a small US company receiving a $10 million consultancy contract when it did not meet the most basic tender requirements. 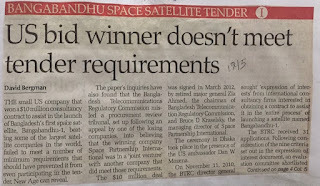 The small US company that won a $10 million consultancy contract to assist in the launch of Bangladesh’s first space satellite, Bangabandhu-1, beating some of the largest satellite companies in the world, failed to meet a number of minimum requirements that should have prevented it from even participating in the tender, New Age can reveal. The paper’s inquiries have also found that Bangladesh Telecommunications Regulatory Commission’s chairman misled a procurement review tribunal, set up following an appeal by one of the losing companies, into believing that the winning company Space Partnership International was in a ‘joint venture’ with another company that did meet those requirements. The $10 million deal was signed in March 2012, by Major General Zia Ahmed, the chairman of Bangladesh Telecommunication Regulatory Commission and Bruce D Kraselsky, the managing director of Space Partnership International. The ceremony in Dhaka took place in the presence of the US ambassador Dan W Mozena. On 11 November 2011, the director general of BTRC sought ‘expression of interests’ from international consultancy firms interested in obtaining a contract to assist it in the ‘entire process’ of launching a satellite named Bangabandhu-1. One company that should have been excluded at this point from proceeding to the second stage was Space Partnership International, the eventual winner of the tender. Space Partnership International was however only registered as a company in the US state of Delaware on 24 November 2009. This is less than a year before the expression of interest was published. In this short period, the company could not have fulfilled these other two requirements. 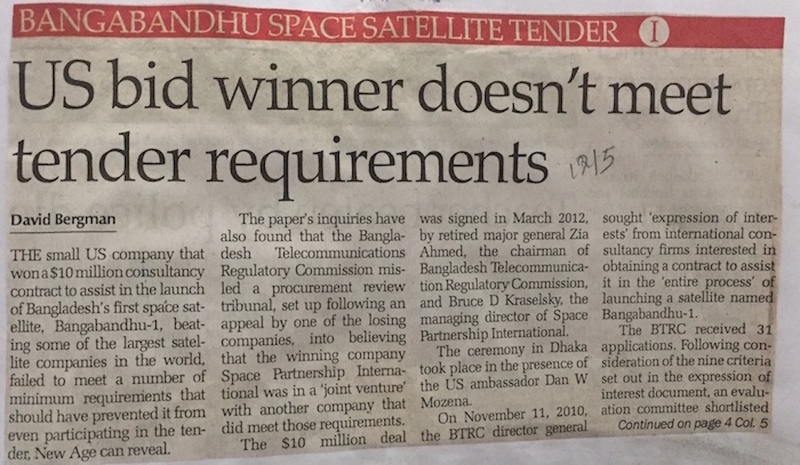 The Bangladesh Telecommunications Regulatory Commission argued that Space Partnership International was eligible to apply as it was in a ‘joint venture agreement’ with another US company, RKF Engineering Solutions Ltd, which has ‘the requisite experience of a minimum of 15 years’. The BTRC was referring to a provision in the Public Procurement Regulations 2008, which suggests that if two of more companies come together in a ‘joint venture, consortium or association,’ the qualifications of any one of the partners to the joint venture can satisfy any particular tender requirement. However, both of the companies which BTRC claim were together in the joint venture have admitted to New Age that they are not part of any such arrangement. Furthermore, during a recent trip to Dhaka, Bruce Kraselsky, one of the founders of Space Partnership International, also said that his company was not part of a joint venture, ‘We have a strategic relationship [with RKF Engineering Solutions]. We are not in a joint venture. Space Partnership International is the prime contractor for this contract. RKF Engineering is a sub-contractor on this project’. Unlike companies in joint venture agreements, the qualifications of a subcontractor can not satisfy a requirement imposed upon the main applicant. It is unclear why BTRC thought that there was a joint venture agreement. In the letter of invitation drafted by the BTRC and which lists the names of each of the seven applicants who had won through to the next round, only the name ‘SPI, USA’ is mentioned. There is no mention of ‘RKF engineering’ which would have been expected were it part of a joint venture. Furthermore, according to rule 54 of the Rules of Procedure 2008, if the two companies were applying as a joint venture, they would have had to provide BTRC either a joint venture agreement ‘signed by all legally authorized representatives’ or a ‘letter of Intent’ to execute such an agreement signed by all partners together with a copy of the proposed agreement. However, according to the two companies themselves, this was not done. Moreover, inquiries by New Age can confirm that even if the two companies had been in a joint venture, RKF Engineering Solutions experience could not have been sufficient to meet the 15 years’ minimum required. RKF Engineering Solutions was registered as a company in Delaware on December 20, 2002, only nine years before the publication of the BTRC expression of interest. On its website RKF Engineering’s says that it ‘evolved’ out of another firm Rubin, Bednarek and Associates which was founded in 1983 with some staff moving from one firm to another. However as the two businesses were separate legal entities, the years that Bednarek and Associates existed cannot be added to those of RKF Engineering. New Age can also reveal that BTRC gave false information to a procurement review panel. The panel was set up by the Control Procurement Technical Unite when another applicant in the tender process Globecomm Systems Inc complained about the integrity of the tender process. This was not correct information; there was no joint venture agreement and, even if there were, RKF Engineering Solutions only had nine years of experience. It was on the basis of this factually inaccurate submission that the procurement review panel ruled that Space Partnership International’s application met the criteria. ‘RKF Engineering has been in business for more than 15 years and the level of expertise that they have is even greater than ours which is 30 years plus. Companies morph and change and grow all the time, the continuity of the people is really the essence of what we have,’ he added. He however failed to respond to detailed questions about how Space Partnership International met the tender qualification when the ‘firm’ only had one year’s experience and it was not a joint venture with a company that did meet the conditions set out in the expression of interest.